Uxmal is a large pre-Columbian ruined city of the Mayan civilization in the state of Yucatan, Mexico. It is 78 km south of Merida, Yucatan, or 110 km from that city on Highway 261 towards Campeche, Campeche, 15 km south-southeast of the town of Muna. Uxmal is pronounced "Oosh-mahl". The place name is Pre-Columbian and it is usually assumed to be an archaic Maya language phrase meaning "Built Three Times", although some scholars of the Maya language dispute this derivation. Uxmal's most distinct structure The Pyramid of the Magician, stands upon a unique oval base and rises to 40 metres in height. The main stairway, bordered by friezes, leads to interior chambers atop and these temples are lined with interesting decorations. The building was built in several stages, as its series of tiers shows, and was extended and restructured from between the eighth to the eleventh centuries. The structure's other title is the Pyramid of the Dwarf, from a story about a magical dwarf hatched from an egg by an old woman. 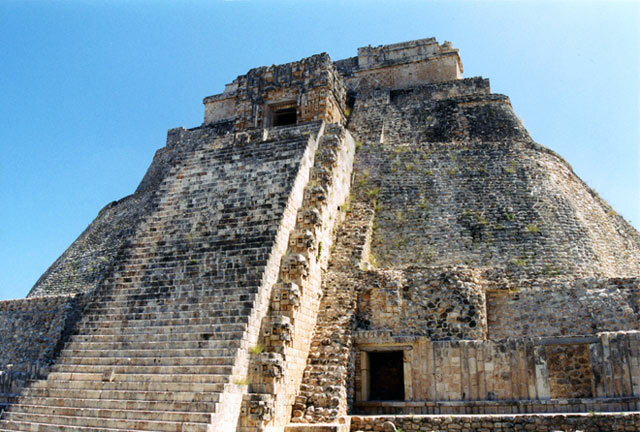 The ruler of Uxmal challenged him to build a pyramid in one day, which he did, and subsequently became the ruler himself.